" The circus arrives without warning. It is simply there, when yesterday it was not." Surreal, lyrical and bewitching- such is the aura of this novel. There are a lot of stories I've left in the middle to take a break for a moment or many moments. But, The Night Circus has latched itself on to me like a fairy-tale latches on to a child's dream. It is about Marco Alisdair and Celia Bowen, two magicians nurtured to become a part of a game with no rules, a game without an end until one of them dies. Their mentors, Prospero the Enchanter and Mr. A.H. set the Circus of Dreams as a stage for their apprentices to take forward their long-standing rivalry. But, the plan goes awry when their hatred eventually evolves into unconditional love and now their moves are for each other rather than against. Amidst this entanglement, is the circus in all its glory, changing with the changing relationship of Marco with Celia, slowly withering away at first and then regaining its fame as one approaches the end. The most beautiful aspect of this fantasy novel is its imagery and the subtle portrayal of love in all its colours. Set near an ahistorical Victorian London, the circus is a garden of ice where acrobats soar without nets, where patrons are in a maze of cloud one minute and on the ground the next, where an illusionist turns her coat to a raven for real and much more. Then there is Celia and Marco, building love letters for each other for years, encased in tents. This is a place which one craves to belong to, just for its beauty but abjures because of the indefinite cost adhered to it. 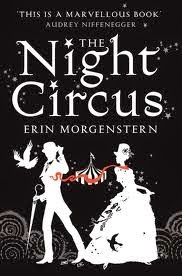 Soon to be made into a movie, The Night Circus is sure to leave any reader pensive. Give yourself a chance to fall in this dreamland where good triumphs over evil again, but in a way never heard of before.